It’s that time of year again and we’re so excited for football! We love this time of year because we get to snack on all of our favorite foods while hanging out with close friends and relax with a beer in hand. 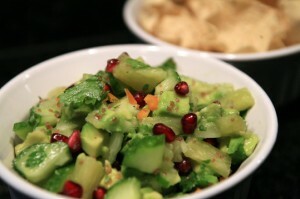 Our Pineapple Guacamole has become a favorite among our group. We actually think our good friend Karin only comes over during football games for this dip (she is not a football fan). The best part about this recipe is that we can indulge all we want without feeling guilty because it’s full of healthy fats and antioxidants. Add veggies to a bowl and add the juice of lime and lemon. Mix together and season with salt, pepper and cilantro. Drizzle with olive oil for extra flavor and garnish a palm full of pomegranate seeds. Serve with tortilla chips or whole wheat crackers. Touchdown! ← Ever Heard of a Garden Peach Tomato? Pretty much the best and most unexpected salsa I have ever had! Seriously, this is SO yummy…and it’s good for you! I hope to make a big bowl this weekend.